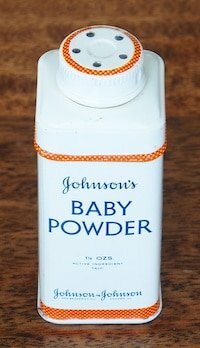 The fragrance of baby powder is distinct and comforting. It conjures images of newborn babies or toweling off after a warm shower. But the reality isn’t quite so idyllic for thousands of Americans who claim that trace amounts of asbestos in talc caused their cancer. Now a new investigation by Reuters argues that Johnson & Johnson, the world’s largest manufacturer of talc-based baby powder, may have known – and covered up – the cancer-causing risk of its iconic product for decades. The U.S. Food and Drug Administration (FDA) does not require cosmetic products and ingredients to be approved before they go on the market. It is up to the consumer to be aware of the talc used in everyday products. For the ingredient list in your favorite cosmetics, check out databases created by The Environmental Working Group or the Campaign for Safe Cosmetics. A Brooklyn jury awarded three retired Long Island Railroad (LIRR) workers a total of 16.4 million dollars for lung disease caused by their exposure to asbestos while working for the railroad. Following an eight day jury trial before the Honorable Lawrence Knipel, Albito Velez-Zapata (age 61) of Massepequa Park, New York was awarded 8 million dollars, Lincoln Aguirre (age 61) of Deer Park, New York was awarded 6 million dollars and James Harrington (age 54) of Brookville, New York was awarded 2.4 million dollars. The consolidated claims were filed under the Federal Employee’s Liability Act (FELA), a special law designed to protect interstate railroad workers. The workers, all machinists, represented by Alan T. Friedman of Jersey City’s Bagolie Friedman Injury Lawyers and Paul Garner, affiliated with Jersey City’s Horn Shechtman, were exposed to deadly asbestos fibers while grinding gaskets on a high revolution wire wheel and while working around contaminated rail cars and locomotives. The jury found that the railroad knew about the dangers of asbestos dust beginning in the 1930s and failed warn their workers of the dangers and failed to protect them from the deadly fibers. LIRR argued that the dust masks were available to the workers, despite the fact that their own Asbestos Awareness Program advised that dust masks were not adequate protection for workers exposed to asbestos. This Asbestos Awareness Program was not implemented until the 1990’s, long after other industries had reacted to their asbestos problems. Additionally, the Long Island Railroad was fined by the State of New York in the 1990’s for failing to implement a Right to Know program to advise their workers of workplace hazards. A Federal law requiring this type of program had been passed in the 1980’s. “The LIRR treated these workers as if they were expendable or disposable, just like the machines that it was their job to repair. The railroad considered them human overhead. This jury told the LIRR in a loud, clear voice that this is no way to treat your employees” said attorney Alan Friedman. This is the second time that attorney Friedman has gotten a multi-million dollar verdict against LIIRR for asbestosis and lung disease. Alan T. Friedman has been certified as a Civil Trial Attorney by the New Jersey Supreme Court and is a founding partner of Bagolie Friedman Injury Lawyers, of Jersey City & Clifton, NJ and affiliate offices in Hollywood, Florida and Brisbane, Australia.